Hindi Keyboard enables you to type directly in Hindi language, it’s an easy and consistent manner, no matter where you are or what computer you’re using, and without installing any software on your computer. Use the Virtual Hindi Keyboard by typing on your own keyboard as though it’s the virtual keyboard, or by clicking the keys on the virtual keyboard directly with your mouse. 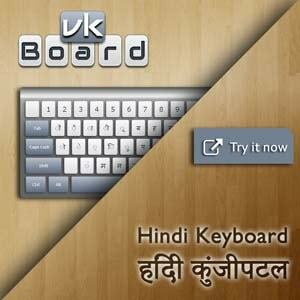 Click or press the Shift key for additional Hindi letters that are not visible on the keyboard. Allowing a person to type in their own language on foreign keyboards – such as when traveling abroad or living in another country. Enabling a more accessible typing experience by allowing typing by clicking in your own keyboard, or by clicking the keys with your mouse. Providing a fast, simple way to switch between different languages quickly. Copyright vkBoard ©2019. All rights reserved.